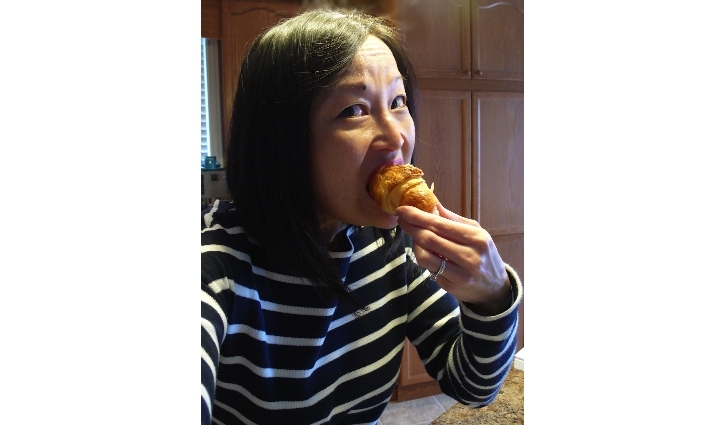 I LOVE croissants…what can I say?? They are flaky, yummy, buttery…what’s not to LOVE? Cupcakes, cake pops, even cronuts will come and go but the French staple will remain!! Through Facebook, I have reconnected with a friend from high school. Ironically enough, I met Prudence Lau in French class way back in grade 11. She now lives on the other side of Canada in Niagara Falls, Ontario teaching high school culinary arts and a college baking apprenticeship programme. She works for Wilton’s teaching cake decorating and over the past several she has taught over 4,000 students and is the member of their President’s Club. She has had her own wedding cake business, and she now also mentors Wilton instructors and teaches cake decorating at Michael’s. Prudence also has been features in a textbook highlighting career opportunities in the food and nutrition subject area and has developed recipes that have been published in cookbooks. On top of that, Prudence is a marathon runner…..whew…I don’t know how she does it all! Prudence and I were messaging over Facebook and I asked her if she would be willing to do a croissant tutorial as the task of making them just seemed a bit too daunting to me! She was up for the challenge!!! In her words…. 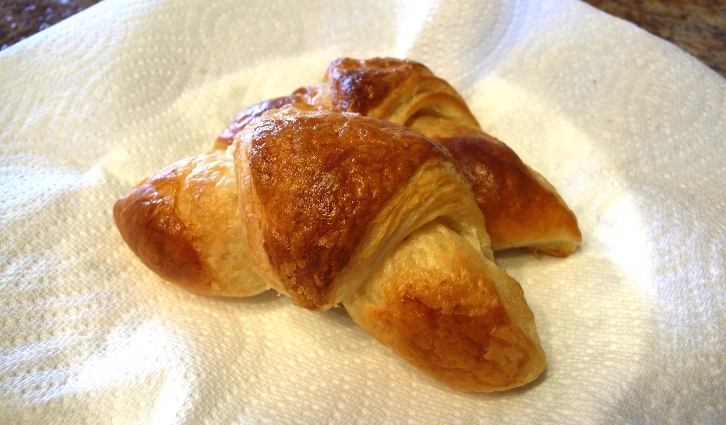 Why did I make croissants? Well you challenged me to. And I never made them before! Truth! Did I panic? (not gonna lie), yeah, a little!. And it was around the time of my first 30k race around the bay, Burlington Bay – scary! So, I kind of used the project as a ‘good luck’ thing…. If the croissants turned out, then I’m was going to have a good race – you know? Kind of silly though. SPS’s likes it!And I had these lovely buttery croissants every morning when I was on our Oceania Cruise (the highly acclaimed Jacques Pépin is the Executive Culinary Director of the restaurants of Oceania Cruises)… Our ship was named the Nautica, and our cruise director was Willie Aames from Eight is Enough (he was Tommy). Yes, he’s a nice guy, I still keep in touch with him – he looks the same, just a little older! Speaking about croissants, they were the best Trevor (her hubby) and I ever had. Trevor said to me, “If you ever find this recipe …we’re dead! You’re going to be making them all the time! And we’re going to be eating these like hot cakes, and will be weighing 500 lbs in no time!”. So for Christmas 2012 one of my gifts from Trevor was Jacques Pépin New Complete Techniques book (click here). 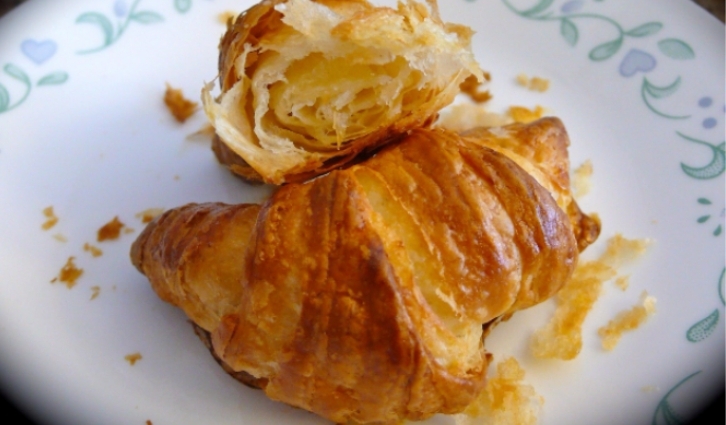 And the first thing I did was look for that coveted croissant recipe… and there it was! Yikes!!! I did not make it until you proposed the project to me, almost early 3 months after receiving the book. Good timing on our part! Hopefully you’re able to follow the recipe and my photos. I’m sure we will! Prudence enjoying the fruits of her labor…she deserves it! Making these beauties is a two day process, but she says it’s totally worth it. And she burn off every bite with all of her marathon training! The SPS Croissant step by step tutorial will be up on Tuesday, July 2. « Friday Find ~ Clear Tray!